Wednesday, September 12, 2012 at 5:43 pm. Speed and a better front camera — my top two feature requests — came true. Battery is a “maybe”. Apple is quoting 8 hours of LTE usage, but I’ll believe that when I see it. I’m still probably going to need a Mophiesque solution for travel days. I guess Apple is okay with the idea of selling iPhone models with two different dock connectors at the same time. That’s not a huge surprise, given that it has gradually introduced many technologies over the years to parts of its product lineup at a time, ranging from USB to Intel processors to the new MagSafe 2. But the dock connector feels different, especially because of all the accessories that Apple sells. Will it still sell iPhone 4S speaker docks in the store, for example? I assume so… But that’s a little bit weird. (The alternative, I suppose, would have been to launch three new iPhones today, with different price/quality levels. But that move hasn’t been in Apple’s iPhone playbook to date, and it’s still not.) Either way, expect the $30 dock adapter to be the accessory of the season. With Passbook, Apple is about to do more for the QR Code (in the U.S.) than anyone before. Certainly more than any dumb ad campaigns. Anyway, this is where 2D barcodes shine — logistics-type stuff. I still don’t think people are going to be scanning them as URL shorteners on magazines and outdoor ads. That’s lame. We’ll have to see what kind of unlocking capabilities the carriers will offer, or if Apple will sell a factory-unlocked version as it has in the past. (It seems that it will. From the iPhone 5 tech specs page: “For those who … are purchasing an unlocked iPhone (for supported GSM wireless service provider networks only) … see your carrier, an Apple Retail Store Specialist, the Apple Online Store, or an Apple Authorized Reseller for pricing.”) I’ve been using an unlocked iPhone 4S abroad this year, and it’s amazing to be able to buy local SIM cards and get cheap Internet access. But with the new iPhone 5 nano-SIM, that might be tricky for a year or two anyway. I’ll probably keep my iPhone 4S as my global-roaming phone for the time being. The new iPod nano is… interesting. It definitely looks a little weird, but I think it’ll still sell pretty well this Christmas, especially with the new iPod touch now starting at $299. I’m curious: What software does it run? (It’s not secretly iOS, is it?) And would Apple ever open it up to developers? Your Kickstarters are obsolete. Good luck getting a second season out of that Elevation Dock that just arrived. (Sure, they say they’ll have a new dock-connector kit. Not holding breath…) Or those iPod nano watch kits. C’est la vie. Good one from Chris Dixon: “Apple: solid incremental improvements. Big question is when/if there will be huge leaps again without Jobs.” Smartphone hardware and software seems to be mostly figured out. Tablets, still some room for significant improvement. But the living room is still what intrigues me the most. 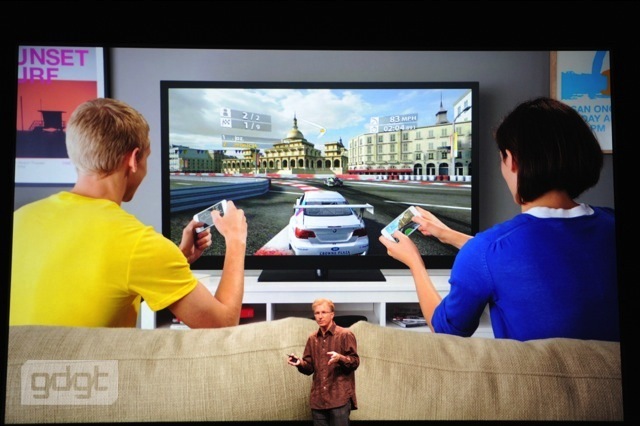 I’ll close with this photo from Gdgt’s excellent liveblog of today’s festivities. This is something to build around.